The sterility testing market is rising with increasing number of dental visits across the globe. The sterility testing market was valued over US$ 750.0 Mn in 2016 and is projected to witness cumulative annual growth rate (CAGR) of over 7.0 % from 2017 to 2025 to surpass the value of US$ 1500.0 Bn by 2025. The global market growth is attributed to increase in the demand for automated products, development of software to support rapid data analyses and growing involvement of research institutes etc. 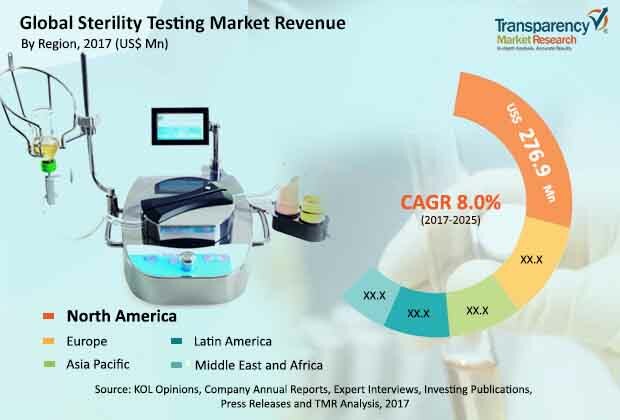 Growth of the sterility testing market is attributed to rising population, technological advancements in rapid sterility test, increase in healthcare expenditure, favorable healthcare insurance coverage, rising prevalence of chronic and rare diseases. According to U.S. Department of Commerce the percentage of people covered by any type of health insurance increased by 1.3 percentage to 90.9 percent in 2015, up from 89.6 percent in 2014. New product innovation, merger and acquisition for product development, government support for research and development are another factors which will fuel the global sterility testing market. Advances in technology in the past few years have enabled the development of new sterility test methods that yield accurate and reliable test results in less time and with less operator intervention than the currently prescribed methods. Strategic acquisitions have strengthened the market position of key players, leading to market consolidation. This is a major trend observed in the global sterility testing market. Moreover, collaborations among key market players enable them to expand their global reach. The sterility testing market is broadly segmented into four categories based on product type, by application, by test type and by region. In terms of product type, the global market is categorized into kits and reagents, instruments and others. The kits and reagent segment accounted for the largest share of the global sterility testing market in 2016, and is expected to dominate the market in term of revenue during the forecast period from 2017 to 2025. Factors such as increase involvement of institute for research and development activity, requirement for repetitive purchase of kits and reagents and easy product affordability etc. are the accelerating the kits and reagent market. The instrument segment is likely to register strong growth during the forecast period. In terms of application, the global market is categorized into biopharmaceutical manufacturing, medical devices manufacturing and others. Pharmaceutical manufacturing segment is dominating and highly growing segment. In terms of test type, the sterility testing is segmented into traditional sterility tests and rapid sterility tests. Traditional sterility testing is the most lucrative test type segment. Advantages such as low initial set up cost, time to return on investment is short to several month are the key factors accelerating the traditional sterility testing segment. Geographically, the sterility testing market is segmented into North America, Europe, Asia Pacific, Latin America and Middle East & Africa. North America dominated the global market and is projected to gain its market share by the end of 2025. This is due to establishment of new biopharmaceutical companies, rising demand for sterility testing, early adoption for advanced technology will fuel the North America sterility testing market. However, the market in Asia Pacific is projected to register a significant growth rate by 2025 due to growing R&D investment, increasing number of pharmaceutical and biopharmaceutical companies and rising demand for drug products in the region. The Asia Pacific market is expected to expand at a highest CAGR in the forecast period from 2017 to 2025 due to rising demand for drug products in the region. The rapidly growing pharmaceutical industry has also attracted the focus of public and private groups toward the safety profile of products, leading to increase in demand for sterility testing. The companies like Merck KGaA, bioMérieux, Inc, Sartorius AG, Thermo Fisher Scientific Inc., accounted for the major share in global sterility testing market in 2016. bioMérieux SA is increasing investments in the industrial application segment to scale up the production capacity of its Craponne (France) and Lombard (the U.S.) facilities. Other global players operating in the market include Sartorius AG, Becton, Dickinson and Company and Rapid Micro Biosystems, Inc. Focus on research and development for expansion of product portfolio is the key strategy adopted by leading players. Sterility testing is used to identify the presence or absence of microorganisms in biological parenteral designed for human use. Sterility testing is essential for pharmaceutical products, biopharmaceutical products and medical devices to be sterile or free from microorganisms. The sterility test for confirmation of the presence or absence of microorganisms is also known as bacteriostasis and fungistasis test.The report on global sterility testing market, analyzes the current and future prospects of the market. The report consists of an executive summary that provides information about the products, its segments and sub-segments, along with a market snapshot and comparative analysis by geography, in terms of revenue %, for 2016. A detailed overview of market dynamics, including the drivers, restraints, and opportunities of the sterility testing market, along with porter’s analysis, of the global market, has been provided in this report. Market revenue analysis for all the above mentioned segments, and their sub segments has been provided for the forecast period of 2017-2025, considering 2016 as the base year, and 2015 as the historical year, along with compound annual growth rate (CAGR %), for the forecast period of 2017-2025. Market share estimations were based on in-depth analysis and study of products, and their features, prices etc. This report provides in-depth analysis of the sterility testing market. The stakeholders for this report include companies involved in the manufacturing of sterility testing. For providing a snapshot of this market to the stakeholders, executive summary section is included in this report, which summarizes the market size, trends and competition in different regions. Market share analysis among the market players is analyzed to signify percentage share of the major players operating in the sterility testing market. Furthermore, the report incorporates market attractiveness analysis by geography that depicts the most attractive and significant region in the global market in 2016. Based on product type, the global sterility testing market has been segmented into kits and reagents, instruments and others. Based on application, the global sterility testing market has been segmented into biopharmaceutical manufacturing, medical devices manufacturing, others. Based on test types, the market is segmented as traditional sterility tests and rapid sterility test. Traditional sterility tests is further classified in to membrane filtration and immersion test whereas rapid sterility tests is classified in to solid phase cytometry, flow cytometry, bioluminescence, nucleic acid amplification, immunological methods and others. Based on geography, the market is segmented into North America, Europe, Asia Pacific and Rest of the World. The regions are further segmented into major countries which include, U.S., Canada, Germany, U.K., France, Italy, Spain, rest of Europe, China, Japan, India, Australia, and Rest of Asia Pacific. Rest of the world includes Latin America and Middle East & Africa. The report also comprises list major players in the market, their SWOT analysis, market share of these players in the Sterility testing market, key business strategies, product portfolios, and recent developments. Key market players profiled in this report include, Merck KGaA, bioMérieux, Inc, Thermo Fisher Scientific Inc., Sartorius AG among others.